This thing works pretty much as advertised. I hung it up on the front of my dresser and filled the PACK Gear Travel Organizer with what I would consider a weekend’s worth of clothes – 4 t-shirts, 2 pairs of shorts, 1 pair of pants, 1 pair of boardshorts, 4 pairs of underwear, 4 pairs of socks, a pair of flip flops, my toiletries kit and a hoodie. 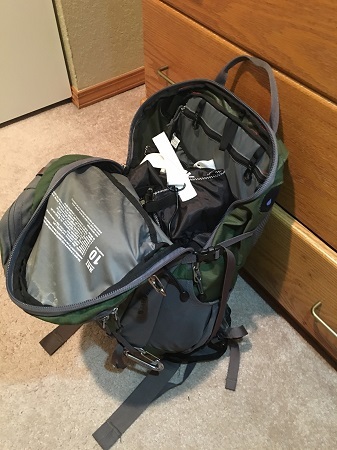 Next I stuffed it into my trusty REI Traverse 30 pack, zipped it up, and shook it around a bunch. When I opened it back up and pulled out the Travel Organizer all my clothes where they should be. Here it is all loaded up with my stuff alongside the 30L backpack I tested it with. The main selling point, the ability to hang this thing up, is pretty slick. I’m the type of person who likes my stuff organized. A friend of mine always gives me a hard time because my packing style is “bags in bags in bags” while he takes the “stuff it all into the main pocket and fish for it later” approach. When I stay in a hotel I prefer to unpack my clothes into the dresser and closet rather than live out of a suitcase. Consequently the theory behind the Travel Organizer really appeals to me. I could see myself using the it on a regular basis for trips where I’m limited to a single bag and space is tight – such as when 6 guys share a hotel room at Whistler to save money. The Travel Organizer is, without a doubt, a brilliant concept. All ready to go with room to spare for my puffy and a few other items. Even though I think this thing is pretty sweet there is still a LOT of room for improvement on a number of fronts. The most concerning issue is it’s construction quality. After very limited testing I’m already seeing stitching coming undone in multiple places. You should reinforce the stitching in a few key spots if you are considering using it for an extended period of time – like a backpacking adventure through Europe (which seems like the perfect use for something like this – I don’t see myself taking it into the outdoors on a backcountry overnight). Its tough to capture accurately with a photo but about an inch of stitching is already undone on the bottom pocket’s divider. If I apply any kind of pressure it keeps pulling apart and getting worse. There are also a few design flaws. The hooks you use to hang it are sharp enough on the ends to scrape the finish off of furniture – rubber ends would be nice. Another issue is the lack of structure. The bottoms of each “shelf” are made out of fabric that doesn’t have any rigidity. This results in the front of each pocket sagging as soon as you put anything inside it. Any small items you toss in there, like your watch or sunglasses, are going to slide out if you leave the sections open. A simple piece of thin plastic sewn between the layers of each shelf, like reusable grocery bags have at the bottom, would mitigate this issue. In a close up of the bottom “shelf” you can see how much the Travel Organizer sags. My sunglasses treat these pockets like slip n’ slides. Finally we come to the lids that keep your stuff in each pocket. They are pretty worthless. Sure they keep your clothes in there and other big items but anything small, such as chapstick or a cell phone charger, doesn’t stand a chance of staying put. The issue is that they don’t actually close. 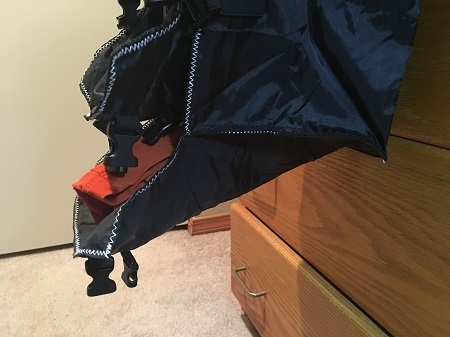 There are a couple clips that hold a flap of fabric over the front of each shelf but nothing like a zipper or velcro that really seals up each pocket. Really anything smaller than some rolled up socks is probably going to fall out. This is a huge bummer and an issue that shouldn’t have made it past testing and into production. Take a look at the top pocket and the bottom pocket. These are completely clipped down so that they are “secure”. I can still easily reach my hand in there and pull my green socks out the top pocket and my red shirt out of the bottom pocket. 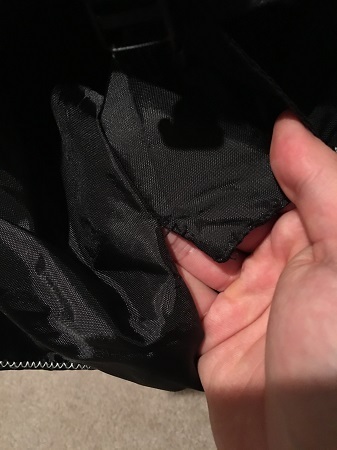 It’s tough to see in this picture but it’s not only the top of the pockets that are open but also the sides so even fully clipped up any small item will slip out. If you take a look at the picture of the Travel Organizer next to my backpack you can see the side gaps clearly. 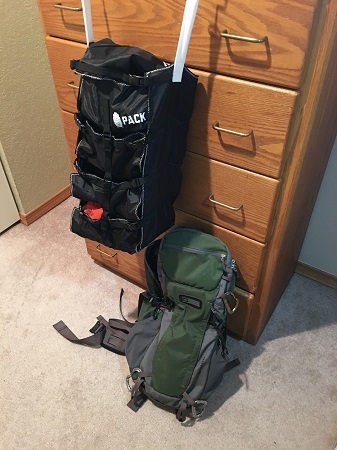 While there are a number of problems with the PACK Gear Travel Organizer it still seems useful enough that someone, like me, who is a neurotic packer might consider using it. 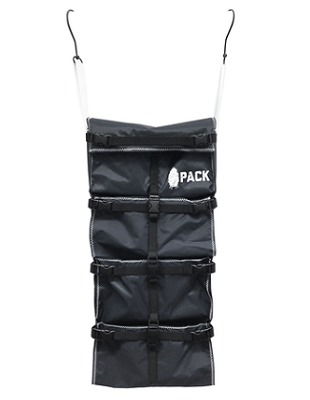 Really though I hope that PACK Gear releases a version 2. The Travel Organizer is a brilliant idea that just needs a bit of refinement to become a great piece of gear. UPDATE: I heard from a very reliable source that PACK Gear is already addressing the issues I brought up in this review and creating a version two of the Travel Organizer to be released in 2016! I can’t wait to give it a try! 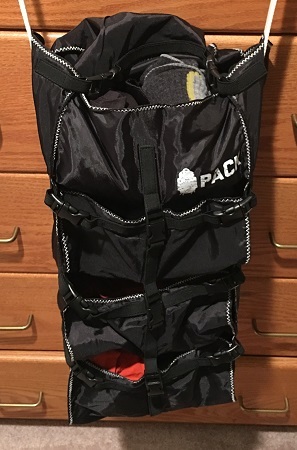 UPDATE #2: It appears that PACK Gear no longer offers the model reviewed here. They now have several new versions out that appear to address the issues I had with their first iteration. NOTE: I received the Travel Organizer for free from PACK Gear, as coordinated by Outdoor PR, in consideration for review publication. This entry was posted in Activities, Activities, Car Camping, Gear, Organizer, Brands, PACK Gear, Activities, Resort Skiing.